The Twilight Lodge has seven rooms and suites, aptly named after constellations, of which no two are alike. 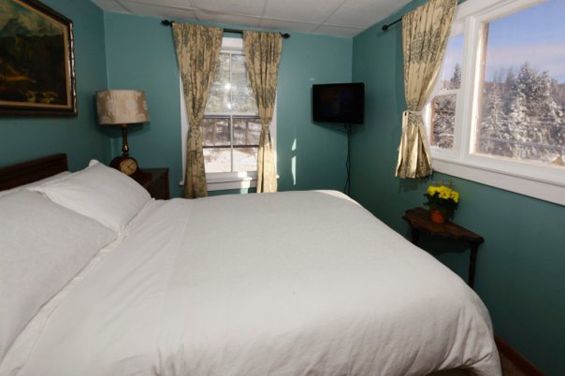 The AQUARIUS room features a queen sized bed and is decorated with an eclectic mix of art and antiques from the innkeeper's onsite shop, Barbara's Art, Antiques and Collectibles Shop. Modern technology compliments The Twilight Lodge's old world charm. This room features a flat screen television, iPod docking station and complimentary wireless internet. The Aquarius and the Boötes rooms share a bathroom. The Twilight Lodge has seven rooms and suites, aptly named after constellations, of which no two are alike. 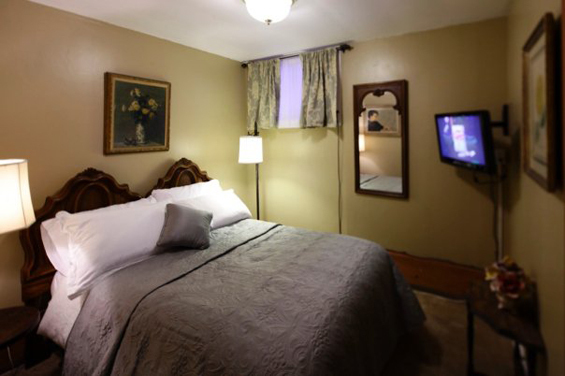 The Boötes room features a queen sized bed and is decorated with an eclectic mix of art and antiques from the innkeeper's onsite shop, Barbara's Art, Antiques and Collectibles Shop. Modern technology compliments The Twilight Lodge's old world charm. This room features a flat screen television, iPod docking station and complimentary wireless internet. The Boötes and the Aquarius rooms share a bathroom. The Twilight Lodge has seven rooms and suites, aptly named after constellations, of which no two are alike. 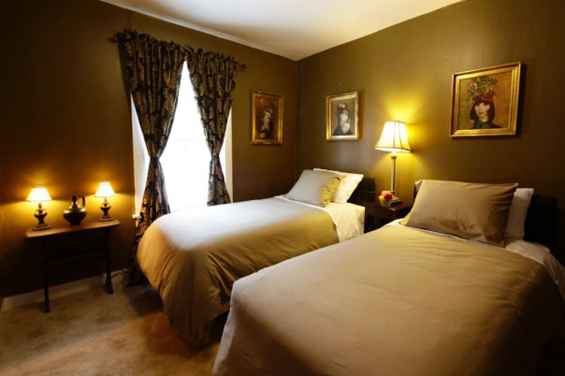 The CARINA room features two twin beds and is decorated with an eclectic mix of art and antiques from the innkeeper's onsite shop, Barbara's Art, Antiques and Collectibles Shop. Modern technology compliments The Twilight Lodge's old world charm. This room features a flat screen television, iPod docking station and complimentary wireless internet. The Cassiopeia and the Carina rooms share a bathroom and a kitchenette with a refrigerator. The Twilight Lodge has seven rooms and suites, aptly named after constellations, of which no two are alike. 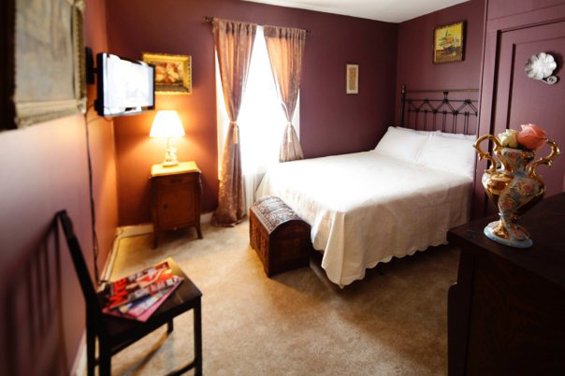 The CASSIOPEIA corner room features a queen sized bed and is decorated with an eclectic mix of art and antiques from the innkeeper's onsite shop, Barbara's Art, Antiques and Collectibles Shop. Modern technology compliments The Twilight Lodge's old world charm. This room features a flat screen television, iPod docking station and complimentary wireless internet. The Cassiopeia and the Carina rooms share a bathroom and a kitchenette with a refrigerator. The Twilight Lodge has seven rooms and suites, aptly named after constellations, of which no two are alike. The CAPELLA SUITE is a two bedroom suite which features one room with a queen sized bed and another room with two twin beds. The charming suite is decorated with an eclectic mix of art and antiques from the innkeeper's onsite shop, Barbara's Art, Antiques and Collectibles Shop. Modern technology compliments The Twilight Lodge's old world charm. This suite features two flat screen televisions, iPod docking stations and complimentary wireless internet. The suite has a private bathroom with a shower and a kitchenette. The Twilight Lodge has seven rooms and suites, aptly named after constellations, of which no two are alike. 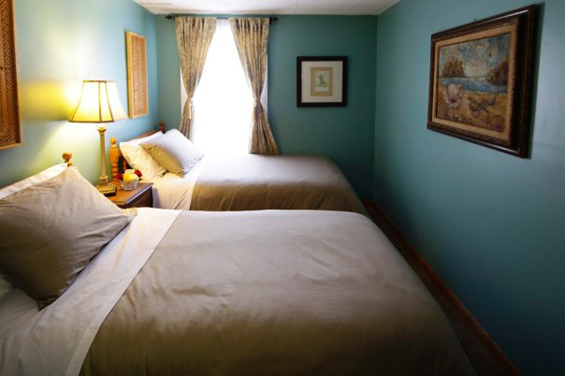 The cozy Delphinus room features a full sized bed and is decorated with an eclectic mix of art and antiques from the innkeeper's onsite shop, Barbara's Art, Antiques and Collectibles Shop. Modern technology compliments The Twilight Lodge's old world charm. This room features a flat screen television, iPod docking station and complimentary wireless internet. The Delphinus shares a bathroom with one other room. The Twilight Lodge has seven rooms and suites, aptly named after constellations, of which no two are alike. The PAVO SUITE is a two bedroom suite with a private bathroom and kitchenette which features one room with a queen sized bed and another room with two twin beds. The charming suite is decorated with an eclectic mix of art and antiques from the innkeeper's onsite shop, Barbara's Art, Antiques and Collectibles Shop. Modern technology compliments The Twilight Lodge's old world charm. The suite features two flat screen televisions, iPod docking stations and complimentary wireless internet. The Twilight Lodge has seven rooms and suites, aptly named after constellations, of which no two are alike. 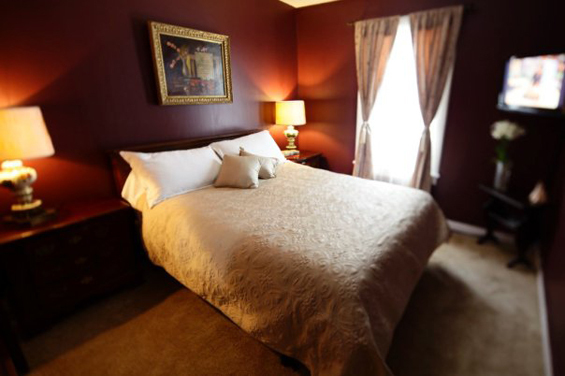 The PEGASUS room features a queen sized bed and is decorated with an eclectic mix of art and antiques from the innkeeper's onsite shop, Barbara's Art, Antiques and Collectibles Shop. Modern technology compliments The Twilight Lodge's old world charm. This room features a flat screen television, iPod docking station and complimentary wireless internet. The Pegasus and the Perseus rooms share a bathroom and a kitchenette with a refrigerator. The Twilight Lodge has seven rooms and suites, aptly named after constellations, of which no two are alike. 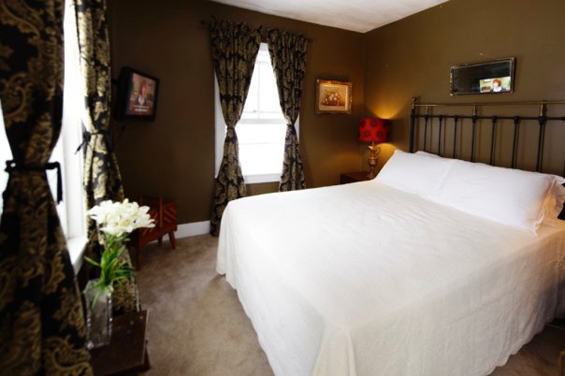 The PERSEUS room features two twin beds and is decorated with an eclectic mix of art and antiques from the innkeeper's onsite shop, Barbara's Art, Antiques and Collectibles Shop. Modern technology compliments The Twilight Lodge's old world charm. This room features a flat screen television, iPod docking station and complimentary wireless internet. The Perseus and the Pegasus rooms share a bathroom and a kitchenette with a refrigerator.